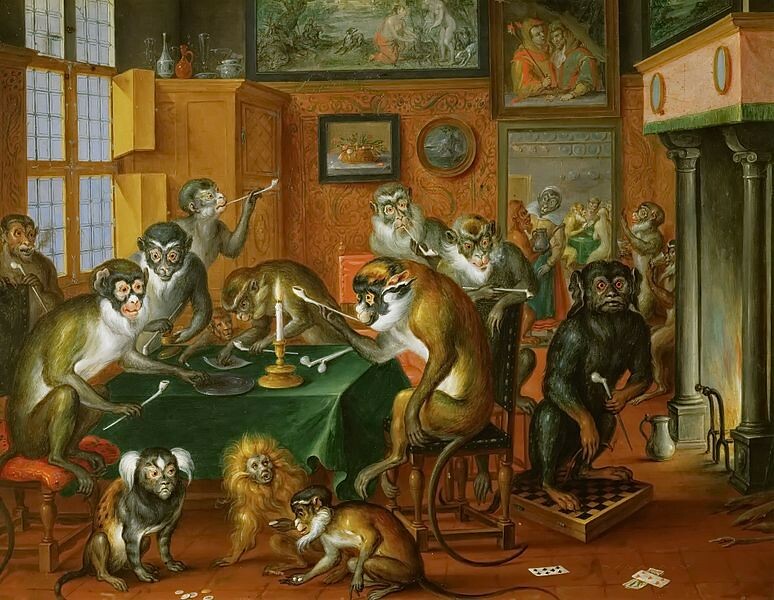 Singerie — from the French for “Monkey Trick” — is a genre of art in which monkeys are depicted apeing human behaviour. Although the practise can be traced as far back as Ancient Egypt, it wasn’t until the 16th century that the idea really took off and emerged as a distinct genre. 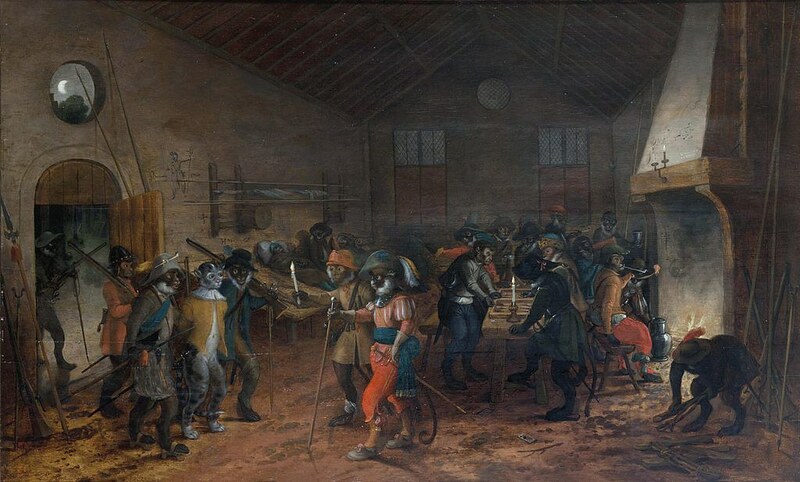 Some of its most famous champions include the Flemish engraver Pieter van der Borcht (whose 1575 series of singerie prints were widely disseminated), Jan Brueghel the Elder, and the the two Teniers brothers, David Teniers the Younger and his younger brother Abraham Teniers. 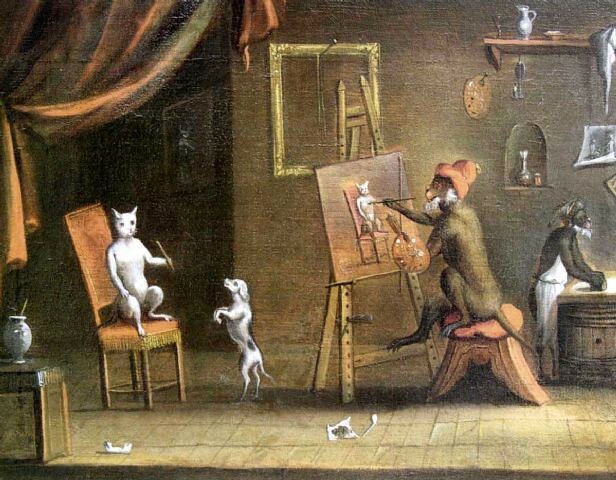 Into the 18th century the genre saw great popularity in France, particularly in the guise of the “singe peintre” (monkey painter), which offered up a perfect parody of the art world’s pomposity. 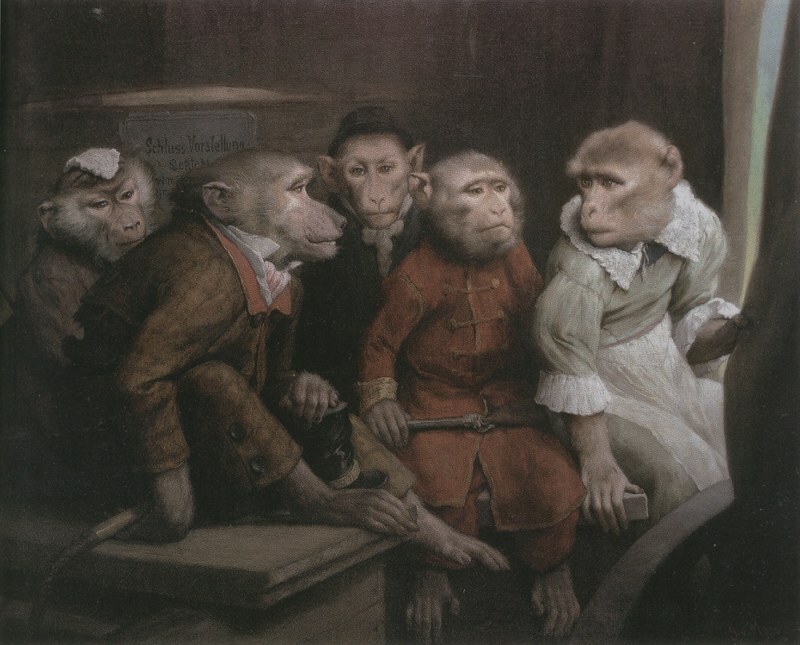 With monkeys, along with apes, being our closest cognates in the animal world, they proved the perfect medium for the satirising of society, which so often thinks itself “above” the animal kingdom. Singeries have proved popular all the way into the 21st century, notably in the fantastic work of the American artist Walton Ford. 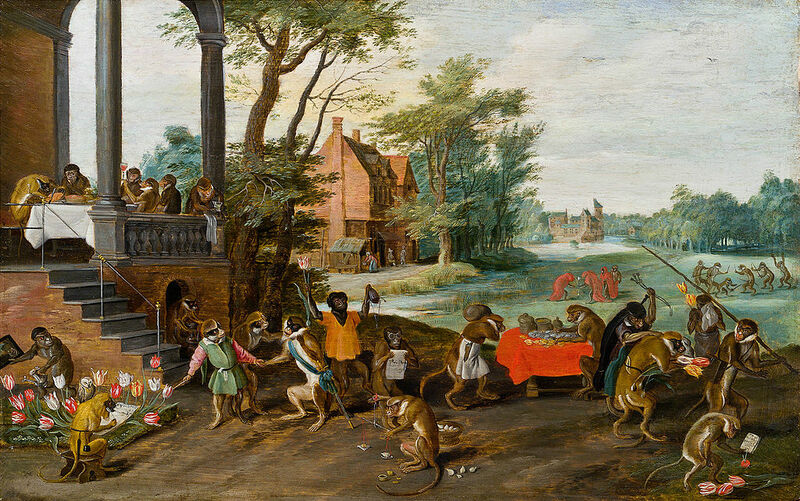 Jan Brueghel the Younger, 1640s. 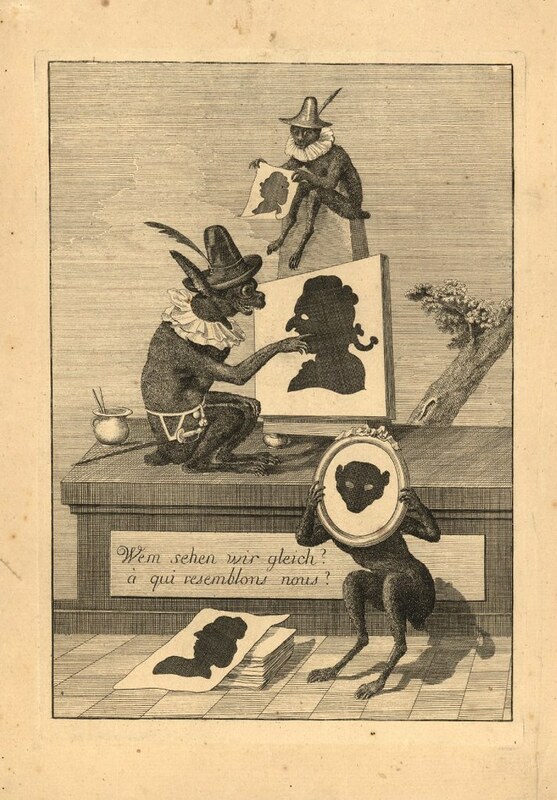 A satirical commentary on speculators during the time of “Tulip Mania”, an economic bubble that centered around rare tulip bulbs. — Source. Pieter van der Borcht (I), ca. late 16th century. 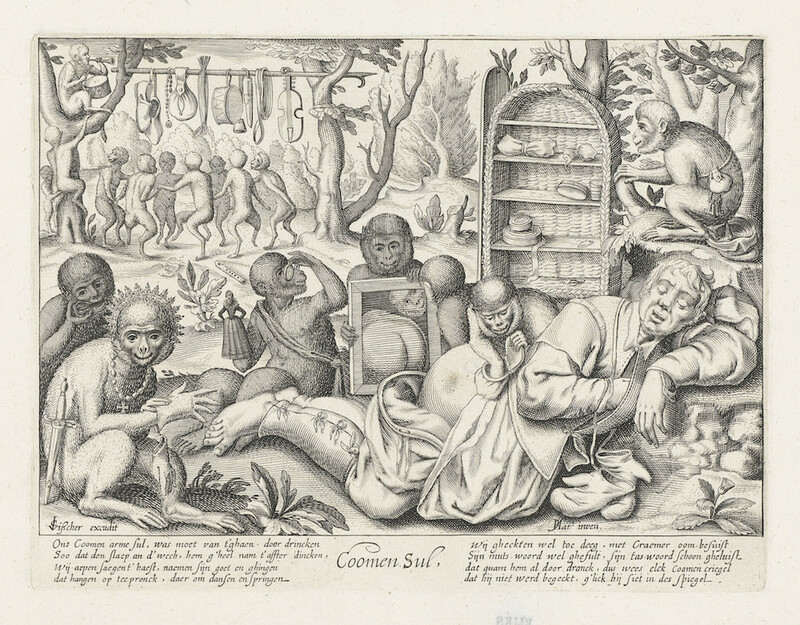 A charlatan doctor sells a cure (seemingly for hangovers, though perhaps for hair loss) — Source. 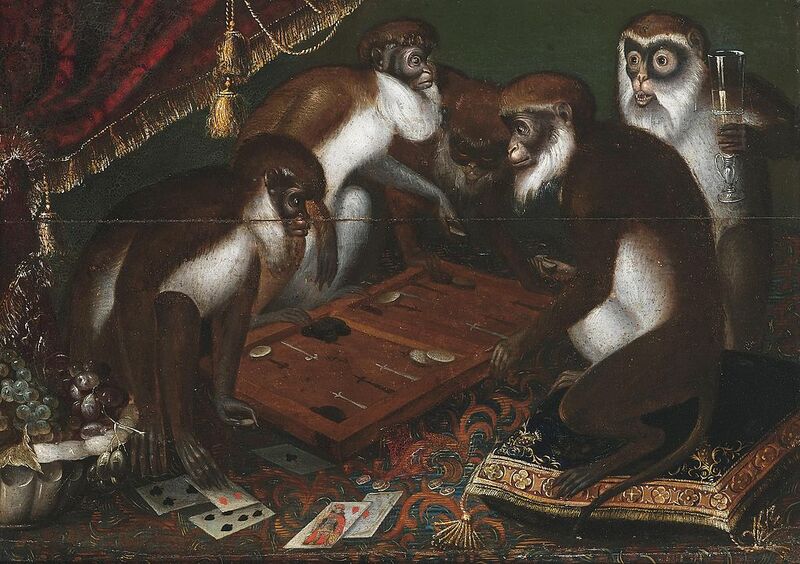 Backgammon-playing baboons, 17th century, artist unknown — Source. 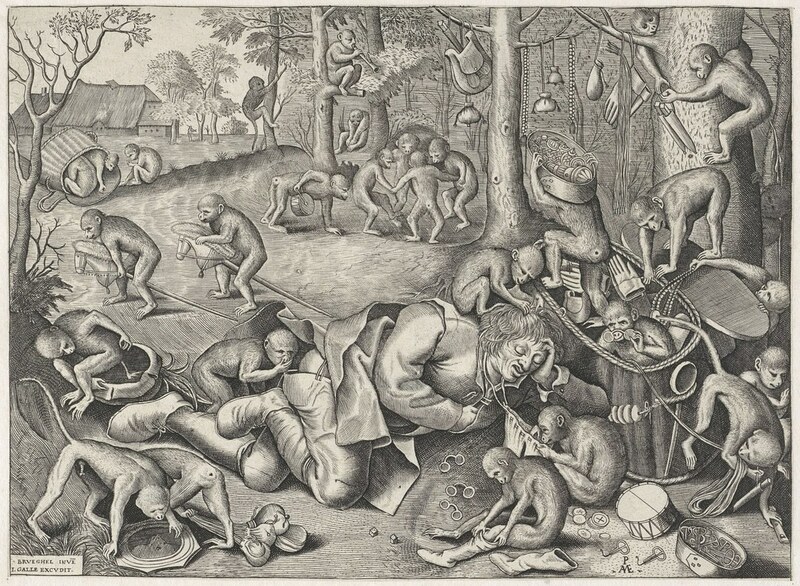 Marskramer door apen beroofd [The Sleeping Pedlar Robbed by Monkeys], a 1562 engraving by Pieter van der Heyden after Pieter Bruegel the Elder’s take on the popular folk motive — Source. 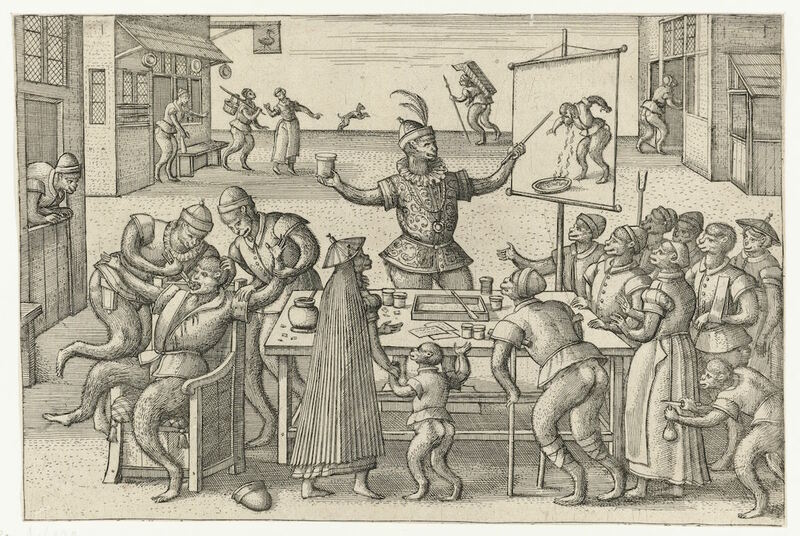 Later version of the above image, by Pieter Feddes Harlingen, ca. early 17th century — Source. Wem Sehen wir gleich? A qui resemblons nous? [Who Do We Look Like? 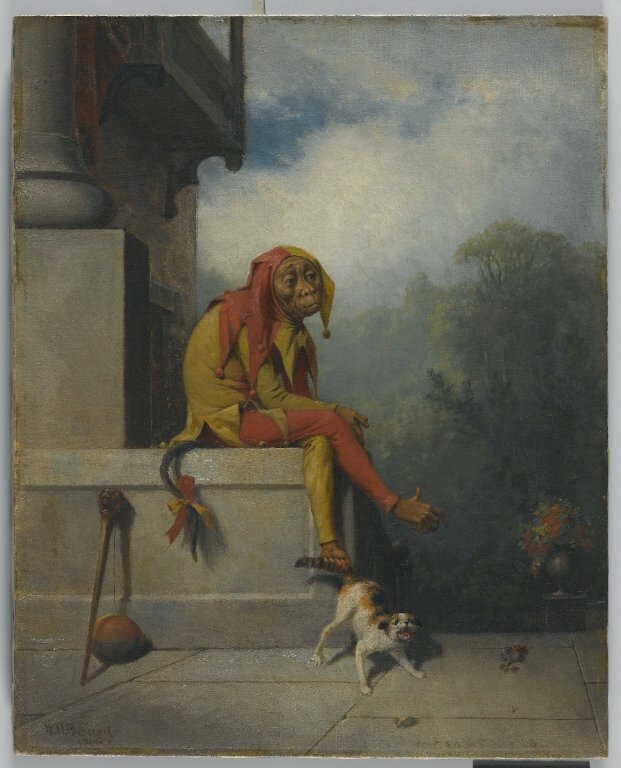 ], artist unknown, late-18th century — Source. 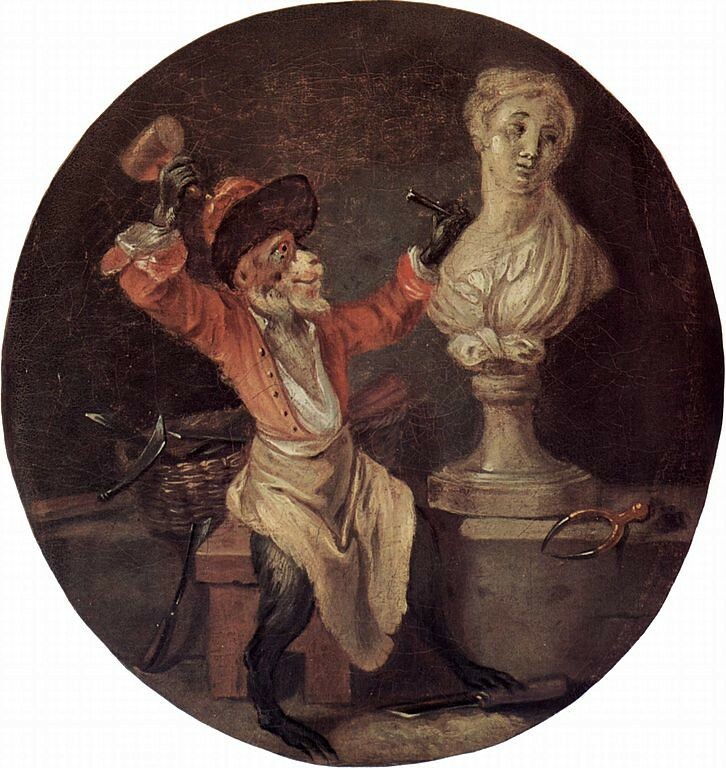 Le singe peintre [The Monkey Painter], Jean-Baptiste Deshays, ca. 1745 — Source. 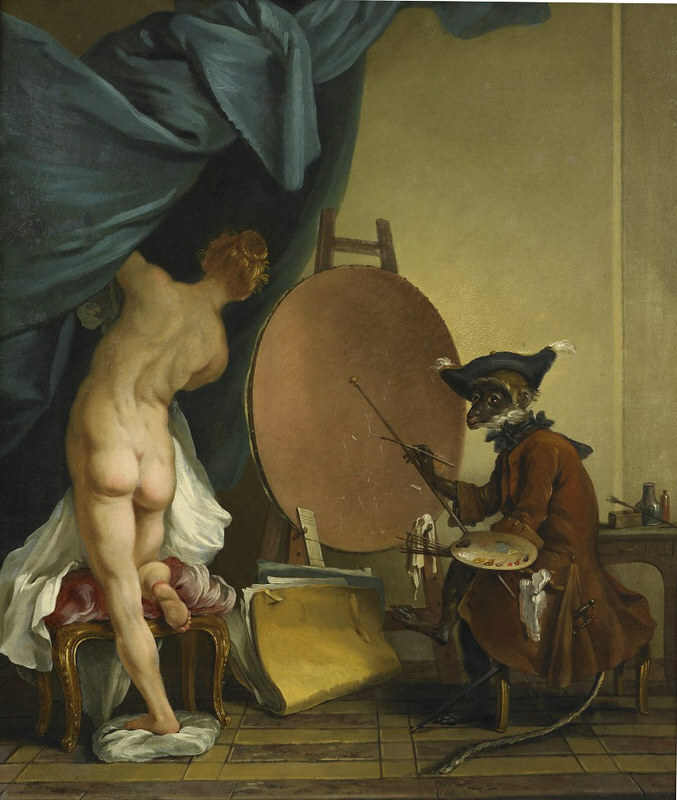 Le singe peintre, aussi dit Intérieur d’atelier [The Monkey Painter, also called Workshop Interior. ], Alexandre-Gabriel Decamps, ca. 1833 — Source. 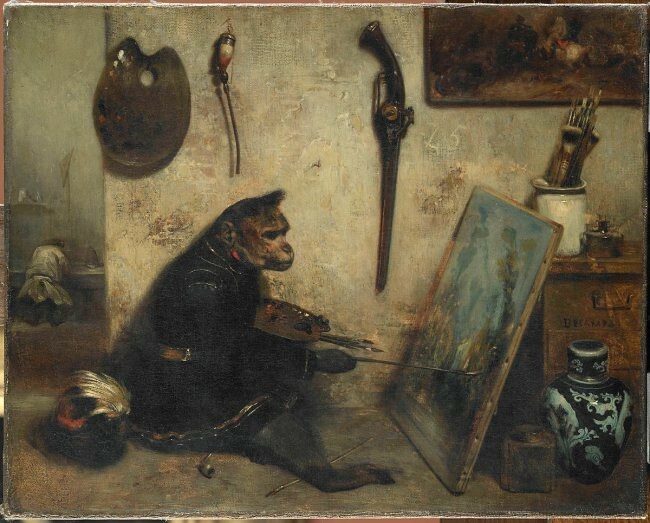 Le singe peintre [The Monkey Painter], follower of Ferdinand van Kessel, ca. 17th century — Source. 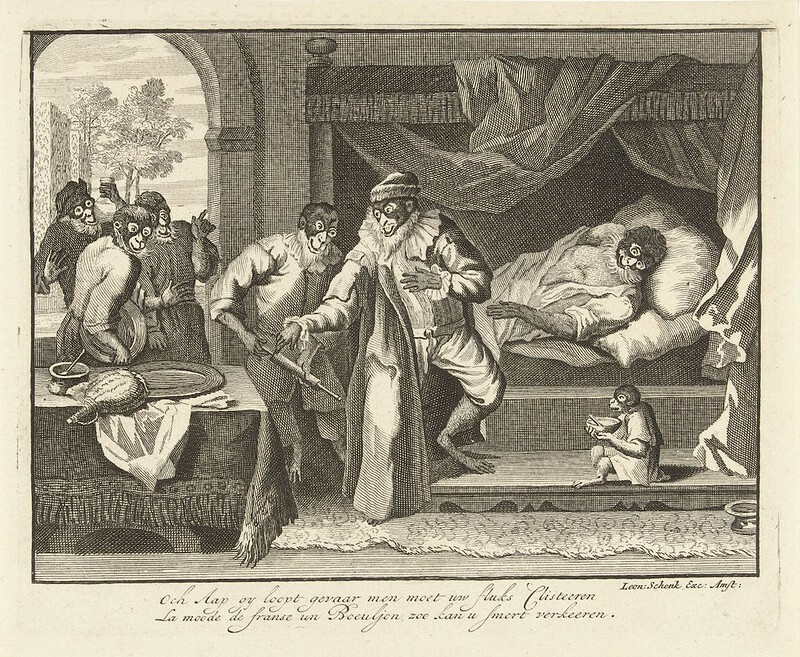 Aap op zijn ziekbed [Monkey on his Sickbed], Leonard Schenk, 1720 — Source. 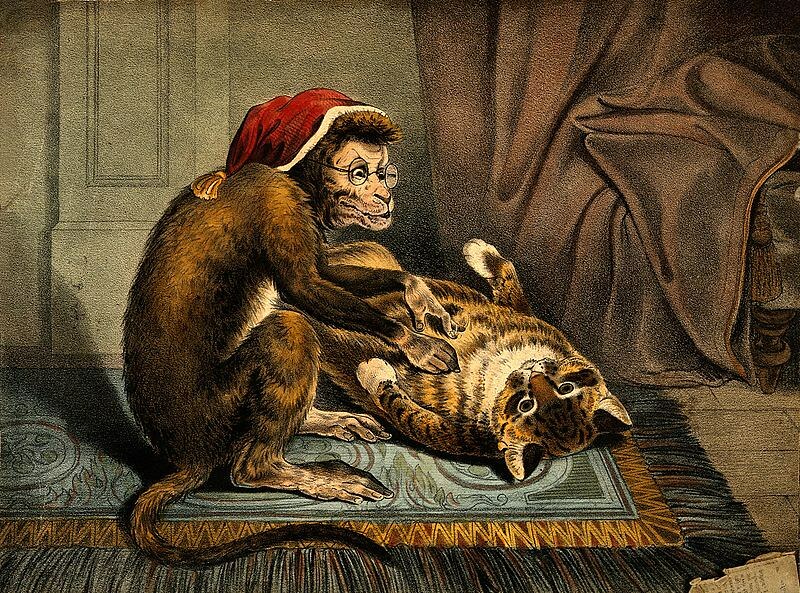 A monkey physician examining a cat patient for fleas, artist unknown, date unknown — Source. 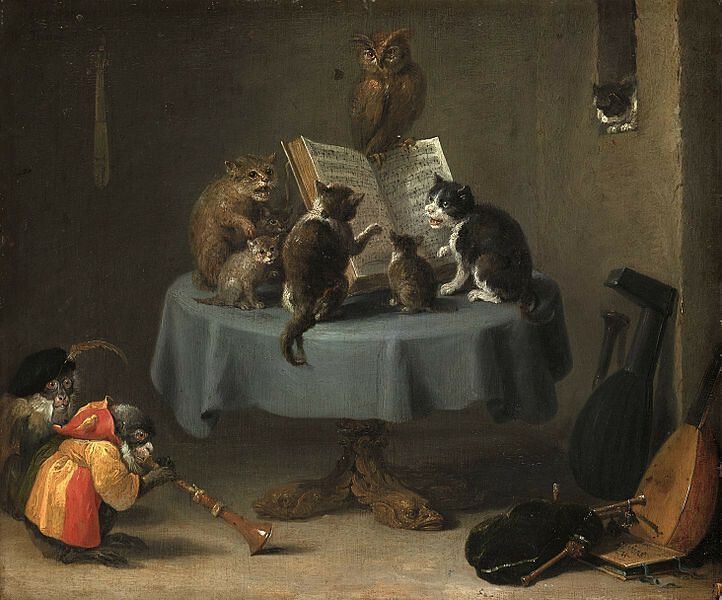 Das Katzenkonzert [The Concert of Cats], David Teniers the Younger, 17th century — Source. 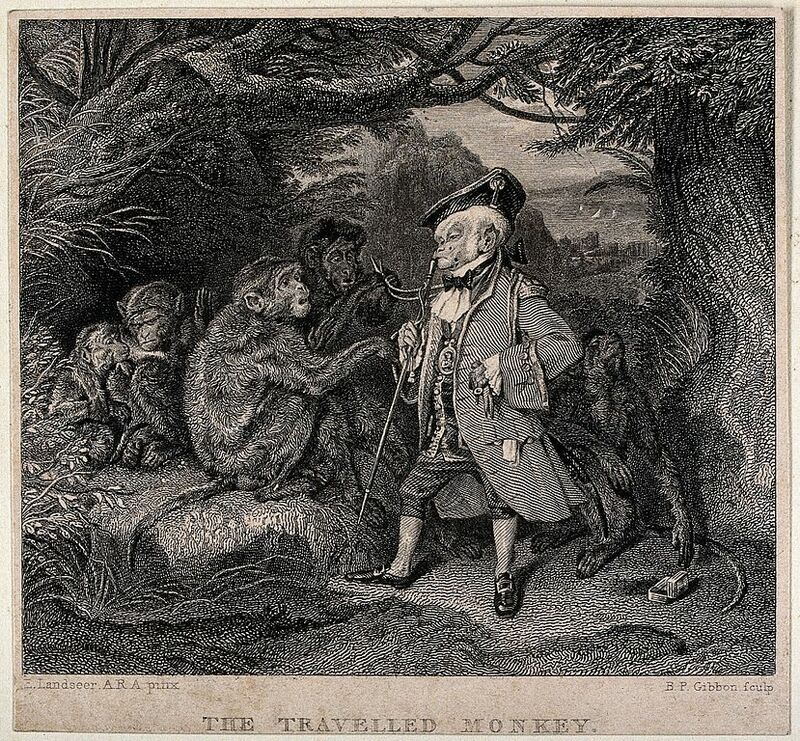 A monkey in elegant costume is addressing a group of wild monkeys under a tree, engraving by B.P. Gibbon after an oil painting by E. H. Landseer, ca. 1828 — Source. For What Was I Created?, William Holbrook Beard, ca. 1886 — Source. 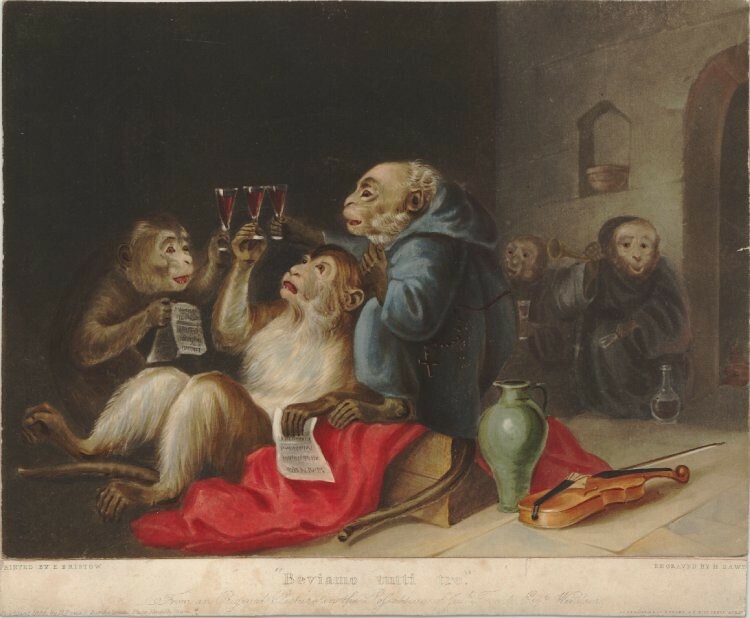 Beviamo tutti tre [We Drink All Three], after Edmund Bristow, 1836 — Source. 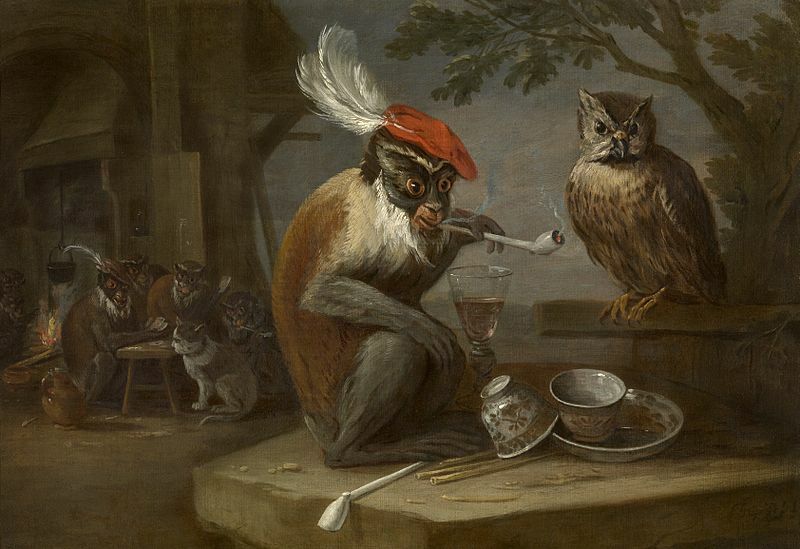 Singerie with smoking pipe, David Teniers the Younger, 17th century — Source. 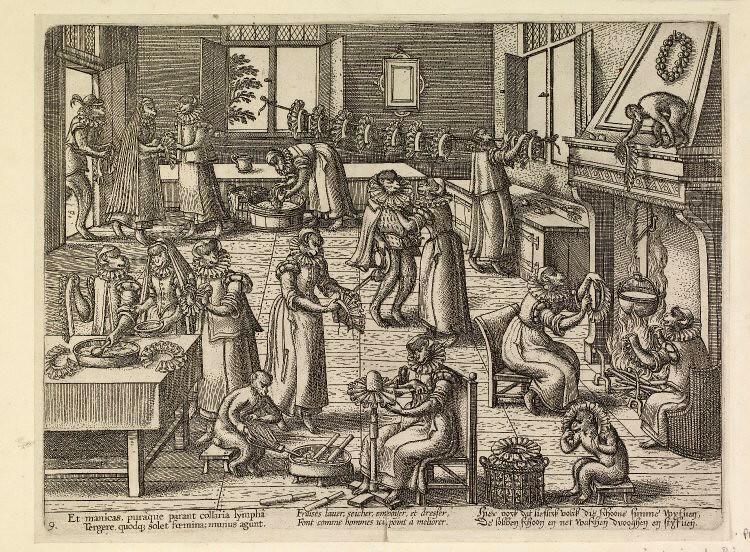 The Laundry from a series of eighteen “singerie” prints by Pieter van der Borcht, ca.1562 — Source. 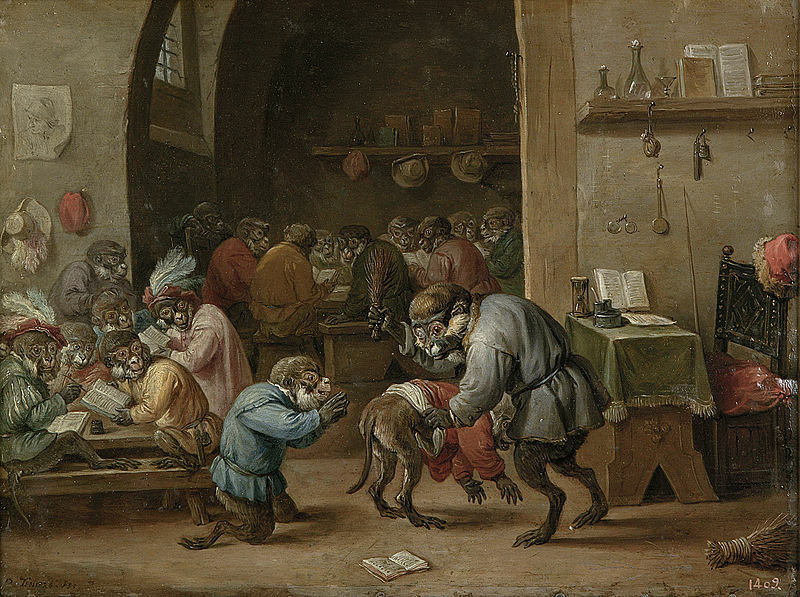 Sebastian Vrancx, early-17th century — Source. 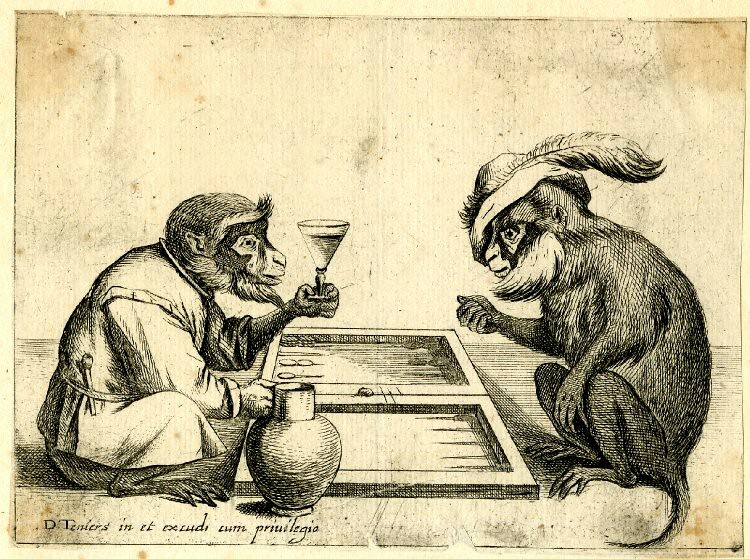 Two monkeys play backgammon, etching after David Teniers the Younger, 1635-1668 — Source. Letzte Vorstellung [Last Performance], Gabriel von Max, ca. 1885 — Source. 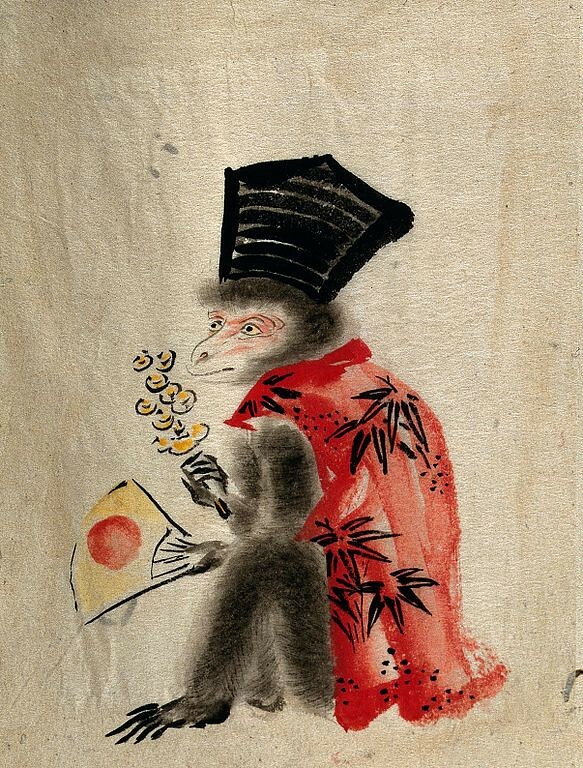 A Japanese style monkey wearing a black hat and red shirt while holding a fan and a flower, artist unknown, ca. 19th century — Source. 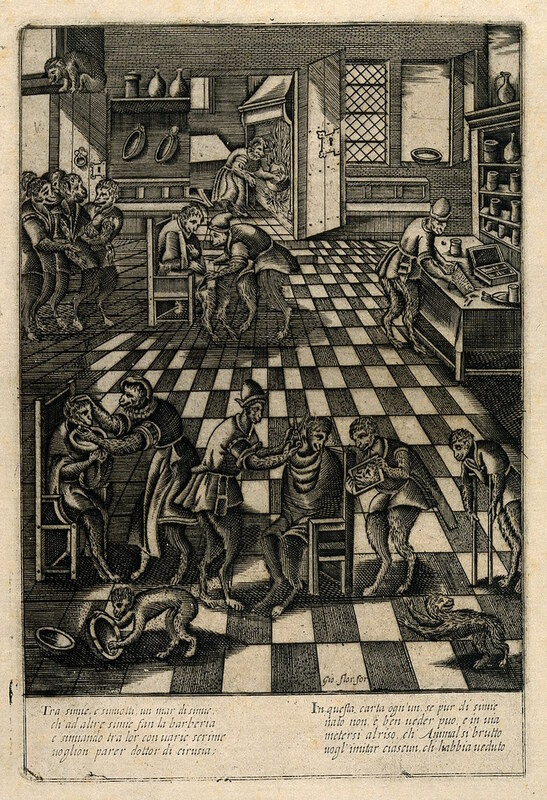 Singerie of a barbershop, engraving after Pieter van der Borcht, ca. 16th century — Source. 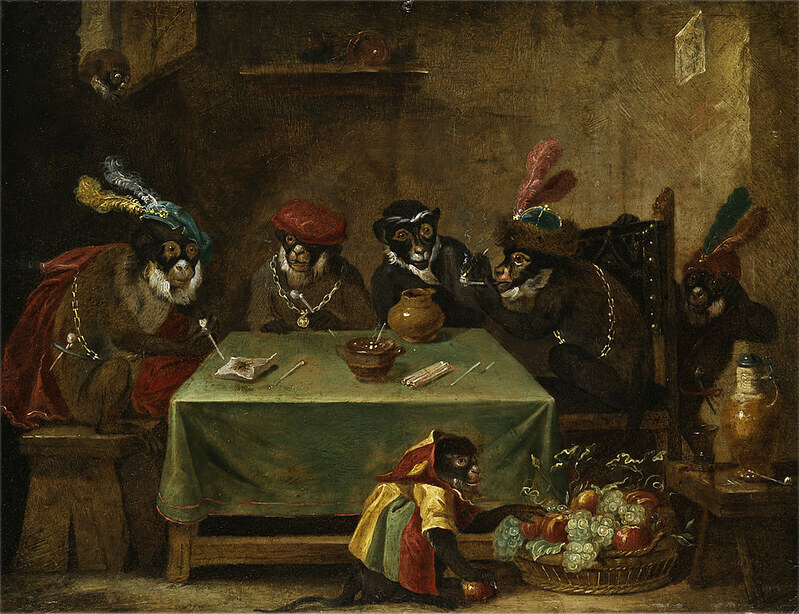 Die tabakrauchende Affenrunde [The Tobacco Smoking Monkeys], attributed to Ferdinand van Kessel, 17th century — Source. Antoine Watteau, ca. 1710 — Source.